A fundamental tension in the war game arose from the fact that, regardless of development and equity considerations, all large nations would have to make cuts eventually, because there simply isn’t enough atmosphere to go around. 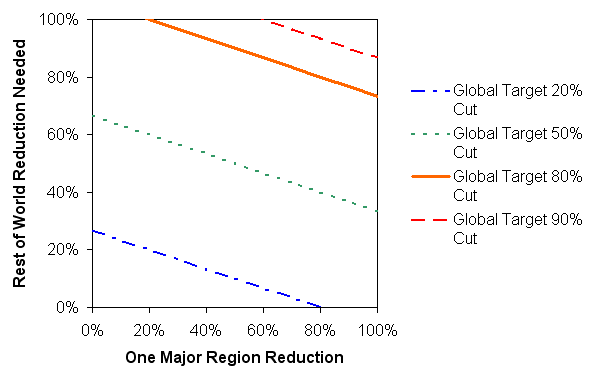 Consider the following graph, showing the tradeoff in emissions cuts for a two-region world. The x-axis shows the size of emissions reductions in a major region, representing a quarter of business as usual emissions (think US or China). The y-axis shows how much the rest of the world would have to cut to meet a global target, given the action of the first region. You can see from the solid orange line that meeting an 80% global cut requires at least a 20% cut from the major region. Otherwise, it’s not physically possible to balance the carbon account (unless free-air capture, a thermodynamic loser, becomes viable). A global target of a 90% cut from current levels – not an implausible requirement in the long run – requires at least 60% participation from the major nation above. Clearly the developing country position of do-nothing-but-grow can be no more than a transient if we are to make real progress on mitigation. Previous Previous post: Climate War Game – Is 2050 Temperature Locked In? Next Next post: Climate War Game – Reduction Illusion?